Do your eyes glaze-over when you hear about capital gains and losses? Like most tax rules, this topic can get confusing fairly quickly–even stumping tax pros. For most, capital gains and losses are easily ignored because the rules are so complex. But ignorance can result in paying more taxes than necessary. Let’s discuss how to offset capital gains. How will capital gains and losses apply to me? You likely know that you can offset your capital losses against your capital gains to reduce your net taxable gain. You know that long-term losses can offset your ordinary income by no more than $3,000, once you have no more capital gains to absorb these losses. You also know that before year-end, you can cherry-pick investments to sell at losses (“tax loss harvesting”) so you can offset your gains elsewhere in your portfolio. Finally, you know that this strategy affects your portfolio, so selling certain investments at a loss only to reduce your tax can wreak havoc with your portfolio allocation. And we certainly don’t need to tell you that you should consider getting input from an investment advisor as well as a tax professional before doing anything rash! What should I know about capital gains? -A capital asset is any asset that you own, whether physical or financial. “Tax loss harvesting” mentioned above refers to selling securities, but capital assets also include your home, car, furniture, jewelry, etc., as well as your financial assets. -If you sell a personal asset such as your home or car for a gain, that gain is usually taxable, unless you qualify for a specific exemption. However, not to worry – most personal assets, except perhaps for your home, are usually sold for a non-deductible loss. -If you sell a capital asset for more than your adjusted tax basis, you have a capital gain. (Your basis is generally what you paid for the asset, or the basis transferred to you through gift or inheritance.) You trigger a capital loss if you sell the asset for less than your tax basis. And if you sell it for exactly your tax basis, you have neither a gain nor a loss, which is almost like flipping a coin and having it land on its edge. -Capital gains rates are preferential, meaning that capital gains rates are lower than the rates on ordinary income, which include wages, taxable interest, rental income, etc. -Capital gain rates depend on (a) how long you’ve held the asset you sold, (b) the kind of asset it is, and (c) your income. However, in this short article, we’ll just focus on (a). Where it really gets confusing is when you have a lot of capital gains and losses that include both long-term and short-term assets, a term used to describe the amount of time you have owned the asset before selling it. A long-term capital asset is one that you’ve owned for more than 1 year; a short-term asset is one that you’ve owned 1 year or less. 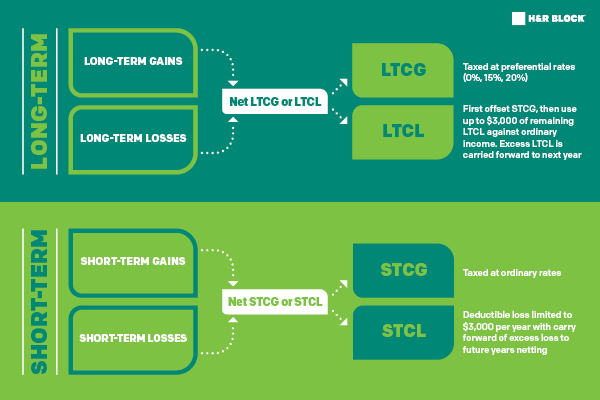 Taxation, like any discipline, is full of acronyms, so we’ll use LTCG for long-term capital gains, STCL for short-term capital losses, etc. The full line-up is LTCG, LTCL, STCG, and STCL. Thus, all your individual sales of capital assets (financial or otherwise) are categorized and netted, and the net result is taxed at capital gain rates, ordinary rates, etc. depending on the nature of the gain or loss. Now, you may not be a guru on capital gains and losses, but hopefully you have enough information to discuss your situation with your financial advisor or H&R Block tax pro.